I have a 97 3500 4x4 with a 5.7 Vortec and 4L80e. I was running a whipple on it. I need more torque for pulling a car hauler. I sold the whipple and bought a 2000 very low mileage (30k) 7.4L L29 motor, PCM, and harness. (Tree fell on a newer truck years ago, insurance totaled, guy grabbed the motor, finally decided to sell it). Based on other posts, I have purchased fuel injectors, FPR, and upper and lower intake gaskets. I also purchased a new billet distributor because the guy that pulled the motor smashed the stock one. I pulled the intake today. Very glad I did. Signs of significant oil leakage pass the lower intake gaskets. Once I get the motor back together, anything in particular I need to be wary of or keep in mind with this swap? Motor mounts? Will I need to change the frame pads or location? 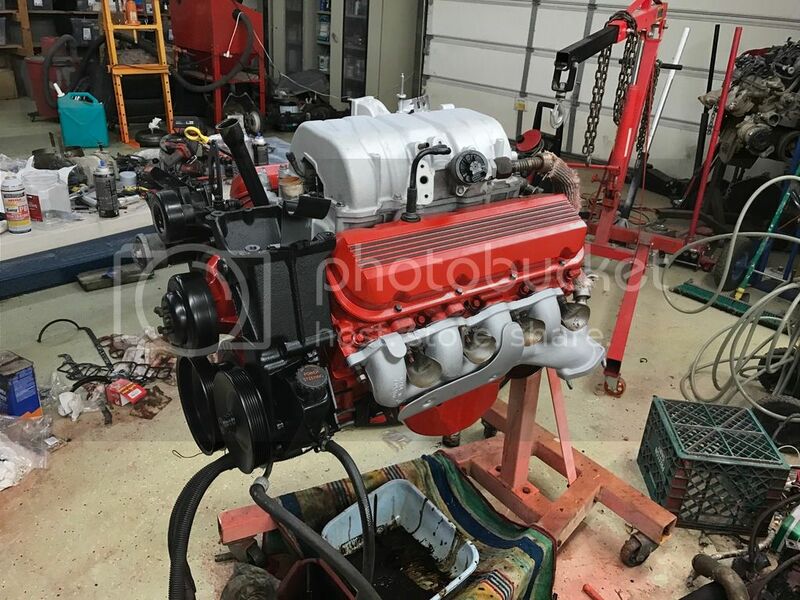 Re: Ready to swap my 7.4 L29 Vortec for my 5.7 - advice? I. Anyone that has done this swap have any advice? Almost ready to install. Cleaned up and installed all new gaskets. I'm working on my own swap from small to big block. The fan shroud is different, the A/C lines haven't been without troubles (although that might just because I am going from a v-belt setup to serpentine also) Motor mounts should be just fine. Obviously you will need to have the PCM tuned. I pulled the 5.7 this weekend. What a greasy mess. I am confused by the motor mounts. The lower mounts are the same on the 5.7 and 7.4. There is no provision on the frame to change the location of the lower mounts. I find it hard to believe that small block and big block bolt up to the same mounts in the same location. Also, looking at the 2 wiring harnesses, very similar with the exception to the fuel injection connections. Since my 5.7 harness is in better shape than the 7.4, I may just try to move only the fuel injection wiring over and leave everything else I can from the original harness. I will hopefully be putting in the new motor next weekend. Wiring harness the following weekend. Running by Christmas. http://www.chevelles.com/forums/44-wagons-four-doors/378543-72-concours-wagon-project.html You might want to read this thread, my friend Philip is doing this to a 70 Chevelle wagon, he'll probably be open to questions about the wiring harness modifications, good luck!! They use the same mounts and shells and frame locations for both motors. The mounts just sit further back on the big block itself. the wiring harness from the donor motor is not in good shape, so I would like to use as much of my stock harness as possible. As I compared the 2 harnesses, all the plugs except for the fuel injection connector look to be the same. I was wondering if I can just cut the 5.7 fuel injection connector off and wire in the 454 connector? Both have the standard injector 1-8 colored/striped wires, so I think I can match and wire those directly? My main question comes with the solid pink wires. The original 5.7 harness has a solid pink wire 3 into 5 junction, and then 3 individual pink wires. The 7.4 harness has only 2 solid pink wires going to the fuel injector harness plug. 1. Anyone have any idea how I wire the original 5.7 pink wires to the 2 pink wires on the 7.4 connector? 2. Any other wiring issues I will run into trying to use the 5.7 harness on the 7.4? 3. Any links to wiring diagrams? Found wiring diagrams for the 5.7 and 7.4. They look essentially the same. Seems the pink wires are common 12v wires? I can just use any 2 on the original harness and connect them to the 2 on the 7.4 nearness connector? Usually on GM vehicles pink or pink w/ black stripe will be 12v with ignition on. The pink wires supply power to the injectors and the pcm will supply ground pulses to complete the circuit and open the injector. It requires less switching to do it that way. In fact more often than not the ECM doesn't send power to any thing it provides the ground.